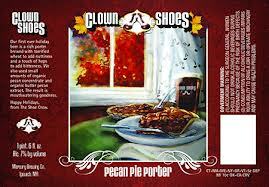 This beer had in past been brewed with pecan extract and recently Clown Shoes changed to using fresh roasted pecans. The beer definitely had some roasted notes and a subtle pecan and brown sugar flavor but not as much as I was hoping. Definitely not liquid pecan pie. This was not a bad beer, just didn’t hit the expectations that I had for it. I think it could have actually been a tad sweeter and for some reason, I wanted to be blown away the flavor of the pecans and I just wasn’t. The mouthfeel was a bit too thin for me and what I like for porters. Once again, not a bad beer at all, just missed the mark in some departments for me. I think pecan is an underutilized ingredient in beer and this was just the 2nd beer I’ve had with it in beer. The Stone Woot Stout I’ve enjoyed and I know Abita Brewing and Lazy Magnolia have a pecan beer, but if any brewers are thinking have using this nut in their beer my advice would be not to skimp on the pecan! The perfect balance of malts and nuts in a beer would Rogue’s Hazelnut Brown Ale. If that can be done with pecans, I’m in! POUR: Medium sized tan head, dark black pour. AROMA: Roasted malts, nuts, coffee. TASTE: Very subtle, maybe too subtle, flavor of pecans and brown sugar. A bit thin on the mouthfeel. My recommendation: Decent porter, but once again, a bit misleading. Was looking for a post supper dessert beer but this wasn’t one to do that.